11 May 2016. Kigali, Rwanda. A new initiative was launched amidst efforts to address challenges of post harvest losses for potatoes and other perishables currently accounting for 40 percent on the continent. The initiative, one million tons of cold storage will see African farmers reduce on wasted resources while increasing returns on investment as result of proper storage facilities for the perishables. 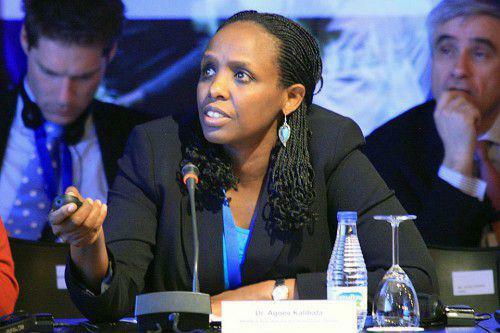 “The initiative will allow farmers to decide on when they need to put their produce on the market and have a greater negotiating power for greater incomes,” said Dr Agnes Kalibata, President of Alliance for Green Revolution in Africa (AGRA). The launch happened on the sidelines of the World economic Forum on Africa –WEF Africa 2016 going on from May 11-13 in Kigali which has brought together over 1,200 business, political, policy making and other leaders to discuss current economic and social issues, problems, ideas and possible solutions. The initiative which is expected Public Private Partnership between AGRA and UPL from India and governments of three countries is expected to mobilize U$ 2 Billion in the next decade to create integrated value chains and set up one million tons of cold storage facilities across Sub-Saharan Africa. Currently, work for the construction of three cold storage projects in progress in Rwanda, Kenya and Uganda and is expected to be fully operational by 2017.